It is finished! 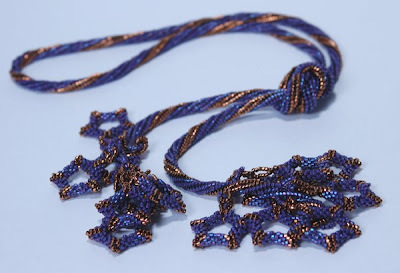 I've mentioned this lariat in my Worktable Wednesday posts, and blogging about it was enough motivation to get it done. It was designed by Marilou Porth who teaches at Artful Bead, and is a member of the Dallas Bead Society. I finished it while listening to some audio that is part of a business and marketing course I am taking online. Adding the stars was definitely my favorite part, and it turned out so beautiful! I've been mentioned on 2 other blogs recently! First, I was a featured designer on A Bead A Day. Second, my Peace Sign Mini Pen is a hot pick on the Jesse Jane's blog. Thanks for featuring me, I'm honored!